No Financial Institution in Madison county is more worthy of mention than the London Exchange Bank Co. Few banks hold a more honorable record, whether it be considered with reference to its age, its manner of doing business, or the personel of those by whom its business has been conducted. 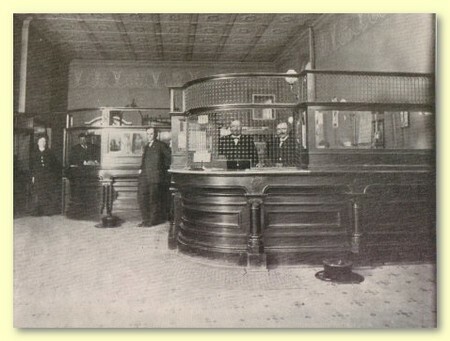 As early as 1864, a private or partnership bank was organized in one of the rooms of the present Hotel London block, its principal owners being Robert Boyd, A. Shanklin and Eliza Chrisman, Robert Boyd being president and A. Shanklin, Cashier. When the Union Bank was erected in 1870, a new bank was organized known as The London Exchange Bank, absorbing the old Madison County bank and located in the commodious room shown above. Of the London Exchange bank, Robert Boyd was president, Stephen Watson, vice president, and Otway Watson, cashier. Stephen Watson died in 1898, and Wm. M. Jones was elected Vice-President. The same year Robert Boyd resigned as president and John T. Vent succeeded him. The cashiers of the bank succeeding Otway Watson, were Wyatt Minshall, Algiers Watson and R. W. Boyd, the latter succeeding to the office in 1893. In 1899, it was, after mature deliberation, deemed advisable to incorporate under the State banking law, which was accordingly done, and The London Exchange Bank company was established with an authorized capital of $60,000, $30,000 of which is paid in, and since then, a surplus and undivided profits of $25,000 have accrued. The officers of the new bank are John T. Vent, president; R. W. Boyd, cashier; W. T. Booth, teller, and Omer E. Jones, bookkeeper. Whether considered as the Old Madison Bank, as the London Exchange Bank, or as the London Exchange Bank company, this institution has ever had the unbounded confidence of the public. There has never been a demand made upon it, but it has been met with promptness. While all the officers who conducted the affairs of the Madison County Bank and all of those named above connected with the London Exchange except John T. Vent and R. W. Boyd have passed away, the affairs of the bank were never more efficiently managed than now. Since the reorganization the deposits have almost tripled, which speaks volumes for the confidence of the public in the present management. The Directors comprise the following well-known names: J. T. Vent, M. S. Murray, R. W. Boyd, J. F. Rankin, S. W. Durflinger and Carey Jones. Every safeguard is provided for the money entrusted to the bank. Its officers are ever courteous and obliging to its customers. Its business reaches out in every direction and the number of its depositors increase from year to year. For this time-honored institution, long distinguished for fair dealing and business capacity we bespeak the continued confidence and patronage of the public.